The Brigadier’s wife is dead. A terrible accident. Grieving, he searches for death, and finds his way to Avalon, the other-dimensional kingdom of the Catuvelauni. The Doctor is also in Avalon, marooned. He’s lost his companions, his TARDIS... and his hope for the future. Now it seems they’ll have to make a new life for themselves with the Celts who live in the Dreamlands. Perhaps even help in the Celts’ negotiations with the Unseelie, the sinister original inhabitants of Avalon, who live far to the North. But then a gateway opens between Earth and Avalon. The British Army arrives in force. And the Brigadier negotiates a treaty that will lead to war in the Land of Dreams. 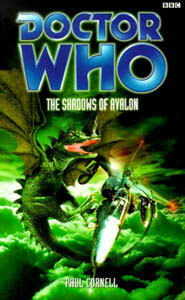 With fearsome dragons duelling jet fighters, vicious Gallifreyan agents causing havoc, and Compassion fighting against her ultimate fate, can the Doctor save the world, his best friend, and himself? This is another book in the series of original adventures featuring the Eighth Doctor, Fitz and Compassion. As the British establish a presence in Avalon, the Doctor and the Brigadier find themselves unable to talk to one another; the Brigadier knows that what he has done is wrong and is unable to face the Doctor, while the Doctor knows that he is taking out on his old friend his frustration about the death of his TARDIS and his uncertainty about Faction Paradox’s meddling with his timestream. The Doctor asks Queen Mab to give him something to do, and she sends him to investigate the disappearances of some of her subjects. But soon after he departs, reports come in of atrocities committed on the border of the Fair Folk’s lands, the ambassador to the Unseelie Court is found brutally murdered, and Queen Mab’s castle is bombed, killing the entire High Council. In response, the Catuvelauni and their British allies declare war on the Fair Folk, and launch a cruise missile at the Unseelie Court. The Court’s magical defenses ward off the attack, and they reshape the geography of their land to prevent any further attacks from getting through -- but their own border villages are being destroyed, and their restraint is not unlimited. Their War Mages come up with a suitable plan; it is said that an avatar of the sleeping Constantine walks the Homelands in human form, and if Fitz and Compassion are sent to Earth to find him, the Fair Folk can focus their magic upon him, heal the rift in the dream and send the invaders back where they came from. Queen Mab knows that she and the Brigadier have made a terrible mistake, and that he is driven by some secret sorrow, but when she tries to question him he is unable to speak about Doris and drives Mab out of the room. Knowing he will never be free of his pain he arranges to have himself assigned to combat, on a mission to take out the domes generating the magical field that protects the Fair Folk’s lands from aerial bombing. He leads an assault through withering ground fire, overwhelming the defenders and destroying the domes, but discovers that against his orders Mab had sewn a magical charm into his uniform, saving his life. When word arrives of the Doctor’s death, the Brigadier blames himself, not only for the Doctor’s death but for those of the hundreds of men who followed his suicidal charge towards the enemy. He is about to shoot himself when the missing SAS soldier, Private Joe Bryce, suddenly materializes and stops him, claiming to have been sent by the goddess Brigida. All those who have vanished have gone to serve Brigida, who will soon come to save the world -- and she does not want the Brigadier to die, but to heal. Although unsure of the source of his vision, the Brigadier returns to battle. He is aware that the Fair Folk are still holding back -- but is unaware that they are trying to exercise restraint in the face of extreme provocation. Fitz and Compassion find London a sullen and desperate place, as the people are affected by the war taking place in their dreams. The War Mages’ detector soon leads them to the avatar of the sleeping Constantine, a nervous businessman named Rex who seems to be expecting them -- and who terrifies Compassion, who feels on the verge of some vast change and understands that Rex can harm her in some unknown way. Rex reveals that as an embodiment of Constantine’s dreams he was a homeless wanderer with no will of his own until two friends showed him how to use his powers to change reality. To Fitz’s surprise, Compassion is so taken aback by his demonstration that she momentarily becomes invisible. Realizing that Rex cannot be reasoned with, Fitz lets Compassion operate the device which will transport him to Avalon -- but it doesn’t work, and they realize they have been set up to fail. But instead of attacking Compassion, Rex flees, leaving her and Fitz sealed in his office with no way out. Cavis and Gandar have failed, and in order to complete their mission they need to access the sleeping King Constantine -- which means convincing the King and Queen of the Fair Folk to launch a ground war against the humans in order to draw their forces away from Queen Mab’s castle, so that a small squadron can clear the way to Constantine. Margwyn, however, has discovered their true nature, and he realizes that he has been manipulated into causing the war he intended to prevent. He tries to kill Gandar but fails, and is forced to flee as Gandar regenerates. As Compassion tries to resist the change she feels is coming to her, Fitz tries to bluff Rex into returning by claiming to have a secret weapon waiting in Avalon. His plan backfires when Rex tries to kill them both, but the desperate Compassion cries out silently for help. In the Time Vortex, the Doctor has just found something vast in the process of being born, something with a link to Constantine and to someone even more familiar. He hears Compassion’s cry and responds, materializing in the office and saving her. Rex reveals that it is he who opened the rift, by planting a seed of power in the mind of Matthew Bedser; each time he flew the same path on his training flights, he carried a bit of Rex with him, just enough to distort space and time and weaken the dreamfield. When the TARDIS collided with the weak point it exploded, creating the rift into Avalon. Now that Bedser’s story has been verified, he has been cleared of all charges and returned to active duty -- but he is still under Rex’s thrall, and Rex has ensured that Cavis and Gandar have overlooked one of the laser beacons planted by the SAS team. Bedser will soon launch a nuclear strike on the Unseelie Court, causing them to respond with their own weapon. Avalon will be rendered uninhabitable, and once Constantine’s domain has been evacuated Rex will seal the rift again, leaving Constantine to rule over nothing while Rex uses his power for his own ends. The Doctor realizes that Rex is an expression of Constantine’s id, just as the protean Brigida is of his ego; Rex is trying to free himself of the restrains imposed upon him by his own consciousness, and the war in Constantine’s dream is a reflection of the war within his own mind -- a war which has been set in motion on both levels by Cavis and Gandar. But whereas they originally conceived the plan, Rex is now acting on his own behalf. Rex, angered by the Doctor and terrified of the threat that Cavis and Gandar have warned him Compassion poses to him, sheds his human form and becomes a mass of pseudo-protoplasm, in which form he tries to kill them. Without understanding how she is doing so, Compassion reconfigures space about the creature, trapping it -- but the Doctor knows that Rex will soon escape, and as he is so easily influenced by others’ ideas, those who see him as a monster will reinforce that form, turning him into a living nightmare. But if an expression of subconscious desires can think for himself and set his own agenda, then so can the Doctor, whatever Faction Paradox may be doing to his timeline. He, Fitz and Compassion set off to cross through the rift to Avalon and save the world. The Brigadier, once again in the front lines of the war and pinned down by enemy fire, finally realizes that he will never stop loving Doris and that she is gone forever -- and without love, even a battlefield is only a place where things happen without meaning. Before anyone realizes what he is doing the Brigadier climbs out of the trenches and walks through a withering barrage of enemy fire to rescue a screaming soldier from where he lies amongst the remains of his friends. He has found peace, knowing that what he had with Doris had to end at some time -- and that, even had he known the pain of the ending, he would not have chosen to avoid loving her. But when he returns to his quarters he finds Boyce and the Knights of Brigida waiting for him, to inform him that the Fair Folk have slipped through their defenses to attack the castle. Cavis and Gandar have taken them there in their TARDIS, and are trying to clear a route to Constantine’s pool -- but just as Mab is about to give her life for her people, the Knights of Brigida arrive to save her. This time, the Brigadier is fighting for the right reasons -- for an end to the war, and for peace. The Doctor arrives, gets behind enemy lines, surprises Gandar and removes his disguise, revealing to the shocked Fair Folk that their War Mages are impostors. The battle stops immediately, and the Doctor warns the Brigadier about Bedser, who is already on his way north to destroy the Unseelie Court. The Doctor then pursues Cavis and Gandar to the pool, where Cavis kidnaps Compassion and takes her to the roof to await the culmination of their plan. The Brigadier and Mab pursue her, but are unable to act against her for fear of harming Compassion. The Doctor, meanwhile, dives into the pool and fights off Gandar’s defenses, to find him telepathically ordering Constantine to kill Compassion. Out of desperation the Doctor rips Constantine free of his quantum generators and orders him to wake up. As the King stirs, Rex vanishes from London, Bedser is freed from his control and aborts his missile run, the forces gathering to attack Compassion dissipate -- and the Knights of Brigida collapse, the link to their goddess broken, allowing Gandar to escape. The Doctor lags behind trying to restore Constantine’s sleep, but finds that he is unable to do so -- and when Constantine wakes fully, the lands of Avalon will return to the real world, where their superimposition upon present-day Britain will kill millions. As Compassion tries to come to terms with her new senses, abilities and emotions, a Presidential TARDIS suddenly materializes around them and they are arrested by Chancellory Guards. Romana reveals that when the Doctor rewired Compassion’s receiver so that it would only pick up signals from the TARDIS, he failed to realize that those signals would take on the form of block transfer computations that would change the very nature of her being. The Time Lords foresaw this development when their attention was drawn to the Doctor’s interference in the affairs of the Obverse, which, the Doctor realizes, is why Iris tried to send him away. Now Compassion has become the first TARDIS Type 102, and the Time Lords intend to take her back to Gallifrey and forcibly breed from her a new generation of living TARDISes for their future war. The Doctor, appalled by what Romana has become, refuses to let her treat Compassion like a slave, and he and Fitz flee into the TARDIS that Compassion has become. At that moment Queen Mab flings the amulet into the pool, restoring Constantine’s dream -- and as the lands of the Catuvelauni return to Avalon, there is one moment of instability which enables Compassion to escape and flee into the depths of the Time Vortex. The Doctor and Fitz eventually locate her console room in the areas of the ship that were shaped by her subconscious, and realize that she is just as terrified by the changes she has undergone as she is delighted by them. Since the Doctor is responsible for those changes, he is responsible for protecting her from their consequences. In the moments during which Avalon existed in two places at once, all of the British soldiers were returned to British soil, except for those such as the Knights of Brigida who had chosen to remain. The Brigadier is one of them, as is his psychiatrist Cronin, who hopes to heal the wounds caused by the war -- including those suffered by Gandar. Gandar has regenerated into a placid man who shares the physical features of both the Celts and the Fair Folk, and who grieves over Cavis’ death and seeks to atone for his crimes. The Brigadier will try to work towards peace, and perhaps he too will find love once again; Queen Mab certainly seems to hope so. They will be aided by the goddess Brigida, who was given form by Constantine’s dream interpretation of Compassion’s transformation. And elsewhere in time and space, the Doctor intends to avoid the Time Lords until Romana remembers that the future is full of possibilities and stops seeking victory over destiny at all costs. Until then, he will be on the run from his own people, destination unknown, in a stolen TARDIS which he cannot control properly. Once again. The Doctor, Fitz and Compassion remain on the run from the Time Lords until The Ancestor Cell, which also reveals surprising information about the fate of the Doctor’s original TARDIS. The TARDIS began seeking out dimensional rifts and temporal instabilities since Revolution Man, followed by Dominion, Unnatural History, and Autumn Mist. The Doctor, albeit unknowingly, curtailed its investigations in Interference; however, it subsequently took him to the alternate reality of the Obverse in The Blue Angel and Mechta in Parallel 59. Romana returned to Gallifrey in Blood Harvest, was appointed to the High Council in Goth Opera, and became President in Happy Endings. The Eight Doctors and Zagreus have somewhat muddied the waters when it comes to dating her subsequent rule; for the purposes of this novel, however, she has clearly been in office for some time and has regenerated since the Doctor last met her. She next appears in The Ancestor Cell. The Fair Folk are a dream-time version of the Silurians, a race with justifiable motives which the Brigadier nevertheless sealed into their tombs. It’s worth noting that the Brigadier’s youth was restored in Happy Endings after he intervened to save the life of a Silurian, which makes the renewed conflict in this novel all the more tragic. The Doctor remembers the promise he made to look after Doris in Happy Endings. The Brigadier asks the Doctor if Morgaine from Battlefield originated from Avalon, which the Doctor replies with a negative. He also mentions that he’s going to be Merlin to Queen Mab. The Brigadier recalls that the last full use of UNIT was the Ice Warrior invasion of Earth in The Dying Days. According to The King of Terror, he returns to Earth at some point after the events of this story. The Doctor says that he sometimes thinks he made a mistake giving humanity fire, a possible reference to 100,000 BC.